The specialized high schools include Stuyvesant, Brooklyn Tech and Bronx Science. MANHATTAN — Next year’s incoming freshman at city’s most elite high schools will be even less diverse they were this year, according to data from high school admissions offers the Department of Education released Friday. Just 4 percent of the students admitted to the eight schools that require the Specialized High School Admissions Test were black, down from 5 percent last year; and roughly 6 percent were Latino, down from about 7 percent last year, according to DOE data. Those schools include Staten Island Tech, where the 346 offer letters did not go out to a single black student, and were sent to just eight Hispanic students. 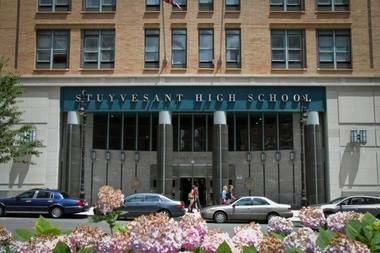 At Stuyvesant High School, the 950 offer letters went to nine black students — less than 1 percent — and 14 Hispanic students — just more than 1 percent. Overall, the number of Asian students getting offers to specialized schools citywide grew to 54 percent from about 52 percent last year, while white students also saw a drop to 27 percent from more than 28 percent the year before. The DOE has repeatedly resisted calls to change the admissions test at the specialized schools, but Chancellor Carmen Fariña said Friday that she is still reviewing ways to boost their diversity. The decrease in offers to black and Hispanic students should put pressure on the DOE and administration to make changes, said David Bloomfield, education professor at Brooklyn College and the CUNY Graduate Center. The drop shows the need for "increased scrutiny,” Bloomfield said. “Particularly with the increased discussion about diversity across the board." “The problem is more pronounced than ever,” he added, blaming the specialized admission test. “It’s an educationally indefensible selection process that’s at fault," he said, adding that students should not be admitted based solely on a single standardized test. Sean Corcoran, professor at NYU’s Steinhardt School of Culture, Education, and Human Development, said that his research showed even if the DOE switched from the specialized high school exam to using state exam scores, the results would likely be the same in terms of lacking diversity. “That’s the nature of the achievement gap,” he said. But while racial diversity at these schools remains an issue, the diversity of the city’s 15 most selective screened schools — like Beacon, Townsend Harris and Millennium — is increasing when it comes to students with special needs. Some 275 students with special needs received an offer to these 15 schools, representing a fourfold increase since 2012 when just 60 such students were given offers. Citywide, the number of students with special needs receiving an offer to a screened high school jumped to more than 2,500 compared to about 900 four years ago, DOE officials noted. The DOE changed its policy regarding special needs students in 2012, requiring that neighborhood elementary and middle schools provide services to special ed students and that high schools aim to enroll special education students at a percentage that matches the number of special needs students in their borough. In some cases, they forced selective schools to take special needs students. The city's handling of special needs students has come under fire from many advocates who say they have not provided schools commensurate support while demanding their inclusion.